I have gone against my most deeply-held principles. I have, for the first time, written a quarter-tone piece. As a just-intonationist, I don’t believe in quarter-tones on theoretical grounds. Quarter-tones provide good approximations for certain eleven-limit intervals: 11/9 (347¢), 11/8 (551¢), 11/6 (1049¢), but the quarter-tone scale emphasizes eleven-based intervals and skips over the seven-based ones. It’s one of my core beliefs that, if we are to accustom the collective ear to assimilate intervals smaller than the half-step, we need to proceed gradually and inclusively up the harmonic series, through seven to eleven to thirteen, and so on. At the same time, I am very fond of Ives’s occasional quarter-tones and pieces by Alois Haba, Ivan Wyschnegradsky, and others in that scale, and so I listen to quarter-tone music as kind of a guilty pleasure: OK for people like me who know by ear what they’re missing, but not the best path for the general evolution of music. It’s always prickly stuff, and my ear enjoys being confused. So I am to be the featured composer at the minimalism conference in Helsinki next month, and I was invited to write something for the Finnish accordionist Veli Kujala, who has invented a quarter-tone accordion. Well, I love the accordion, and have always wanted to write for it (even though I rather think inventing a quarter-tone one should have been prohibited by law even in Finland), and I couldn’t resist. I took Ives’s article “Some Quarter-Tone Impressions” as my theoretical basis. 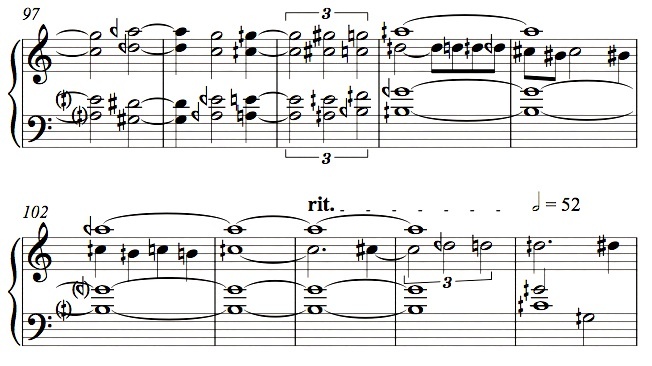 Ives speculated that the way to build up intelligible quarter-tone harmonies was to build up triads and seventh chords rooted on the perfect fifth, so he gives examples such as C and G with an Eb and Bb a quarter-tone flat (which makes a nice 1/1-11/9-3/2-11/6 just-intonation, neutral seventh chord, though it’s not clear that Ives understood that), and also C and G with D and A a quarter-tone sharp, and C and G with E and B a quarter-tone sharp. And so the piece, which I titled Reticent Behemoth because it growls for awhile and finally breaks into a tune at the end, moves through the quarter-tone scale in fourths and fifths, experimenting with every possible combination of fifths from each of the 12-tone scales a quarter-tone apart. It was a fun exercise, and I really had to teach myself all the quarter-tone combinations. And I guess it will be played in Helsinki at the end of September. Like the recovering drunk who buys a drink at a bar and announces, “I conquered my goddamn will-power!,” I’ve overcome my own theoretical convictions. As a coincidence, I had checked your work list yesterday, after a long time, to see whether there was anything new. I was surprised to see a “quartertone” something, remembering that you were not fond of that. I’m looking forward to reading more from you about this subject when you have the time. There’s nothing quite so tragic as a deeply held musical belief slain by a beautiful composition..
Well, it’s always good to shake up one’s own predilections a bit… I look forward to hearing the quarter-tone accordion! Of course, accordions are already microtonal, given the various degrees of “wet tuning” and the natural fluctuation of the reeds. I imagine he’s using a scrupulously dry tuning, but I still expect some delicious aural confusion. My ears are not well-trained like yours but I’ve enjoyed quarter tone (I think) accordions in Middle Eastern music. Especially the unusual Azeri “oriental” garmon accordions, with piano-format keyboards on both sides, some of which have quarter-tones. I think some of their keys have whole tones on the pull and quarter tones on the push of the bellows – the player has to keep track. Is that how Veli Kujala’s design works? Does Pauline Oliveros play just intonation accordion? KG replies: Pauline does have a JI accordion; I have the tuning written down somewhere. Veli’s accordion I think has quarter-tones every other key, so it is possible to play mixed chords with only some quarter-tones. I thought I might try my hand at a more consonant quarter-tone piece, and to do so I fashioned a 15-tone scale including the eleven-limit intervals that, as I understand, are common in Arabic music. I’ll announce it if I manage to finish the piece.